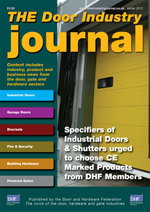 We are delighted to let you know that our 68 page Winter 2012 edition of the Door Industry Journal just went live and is now available to read online alongside three years worth of archived issues on our dedicated "Door Industry Journal Online" website. If you are using an Apple iPad, Tablet PC or other mobile device this direct link to the Winter issue, bypassing our website may be an advantage. Our printed edition is currently on the presses and will be mailed out on Friday 14th December. If you do not currently subscribe, or wish to sign up a colleague, you can do so via the subscriptions page on our main website. And don't forget to keep visiting this Blog …..
To maximise the coverage of all articles they will also be posted on this Blog, starting after publication in print next week along with the latest news from the door and gate industries as it breaks. To keep up to date with news in between our published issues, sign up to receive notifications of new postings (see below) or just visit our Blog on a regular basis. And last but not least, we wish our readers and everyone involved in the production of our magazine a Merry Christmas and prosperous New Year.